Things are still MURKY…LOVE IT!!! There are only SIXTEEN games left in the NFL Regular Season and there are still THREE spots open in the NFL playoffs. Only ONE team has clinched its seed in the playoffs, so Week 17 is meaningful for a lot of teams in the NFL. In this blog I will go through BOTH conferences and talk about what EACH team needs to do to SECURE spot for the playoffs. The Pats got an EASY win over the Bills on Sunday and CLINCHED a first round bye. They OWN the tiebreaker over the Steelers so then can clinch home field advantage next week and NOT have to travel until the Super Bowl. Clinching Scenario- The Pats can CLINCH home field advantage for the AFC playoffs with a WIN over the Jets at HOME on Sunday OR a Steelers LOSS to the Browns at HOME. 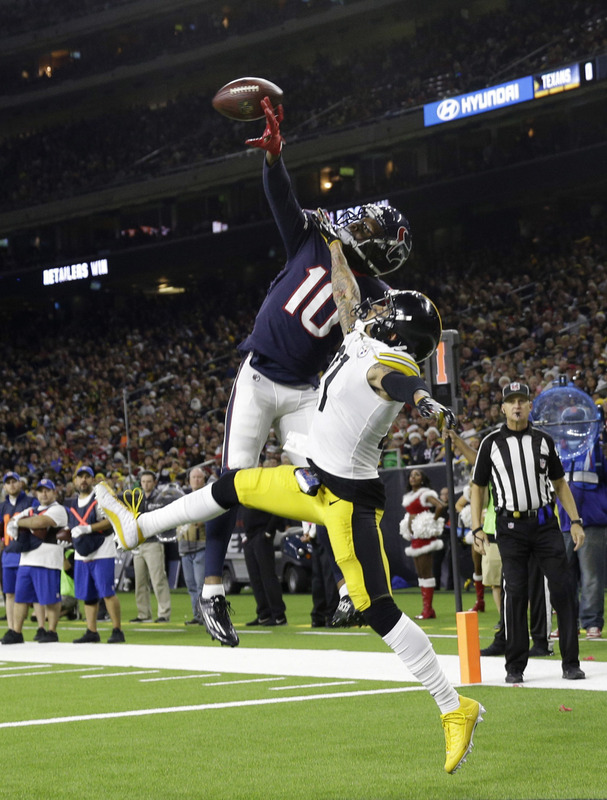 The Steelers took care of the Texans yesterday and like the Pats, they also CLINCHED a first round bye. The Steelers need some HELP from the lowly Jets on Sunday to get home field advantage, so there is a chance it COULD happen. Clinching Scenario- The Steelers can CLINCH home field advantage with a WIN over the Browns AND a Pats LOSS to the Jets. The Jags CLINCHED the AFC South on Sunday despite LOSING to the 49ers on the ROAD. The Jags CANNOT move UP or DOWN from their current position and will go into the AFC playoffs as the THREE seed, no matter what happens in their game against the Titans on Sunday. The Chiefs DESTROYED the Dolphins on Sunday and CLINCHED the AFC West with that win. The Chiefs CANNOT move UP from the FOUR seed, so their game against the Broncos on Sunday is MEANINGLESS. The Ravens were the ONLY team that was tied for the AFC Wild Card that got a WIN on Sunday. The Ravens were OUT of the playoffs going into Week 16, but now they control their OWN destiny going into Week 17. Clinching Scenario- The Ravens can CLINCH the FIVE seed in the AFC with a WIN over the Bengals at HOME on Sunday OR IF the Bills LOSE to the Dolphins on the ROAD OR IF the Titans LOSE to the Jags at HOME. The Titans LOST to the Rams at HOME on Sunday and were ELIMINATED from CLINCHING the AFC South as a result. The Titans plays the Jags on Sunday AND they still control their OWN destiny. Clinching Scenario- The Titans can CLINCH a playoff spot with a WIN over the Jags OR IF the Bills LOSE to the Dolphins AND if the Chargers LOSE to the Raiders at HOME on Sunday. The Chargers BARELY beat the lowly Jets and remained ALIVE for the playoffs going into Week 17. The Chargers are the FIRST team out of the playoffs BUT need help from other teams in the AFC on Sunday to get into the playoffs. Clinching Scenario- The Chargers can CLINCH a playoff berth with a WIN over the Raiders AND a Titans LOSS to the Jags AND a Bills LOSS to the Dolphins. The Bills got BLOWN OUT by the Pats on Sunday. The Bills controlled their OWN destiny going into Week 16 and NO LONGER do so going into Week 17. The Bills need A LOT of help from other teams in the AFC to get IN the playoffs for the FIRST time in TEN years. Clinching Scenario- The Bills can CLINCH a playoff berth with a WIN over the Dolphins AND a Ravens LOSS to the Bengals on Sunday. That was a look at the AFC playoff picture and now onto the NFC playoff picture. The Eagles CLINCHED home field advantage with a WIN over the Raiders at HOME last night. The Eagles have NOTHING to play for next week so they can use that week to get ready for the playoffs. The Vikings got a WIN over the Packers on Saturday Night and now can CLINCH their first round bye on Sunday. The Vikings will only play ONE road game for the rest of the season IF they WIN the Super Bowl. Clinching Scenario- The Vikings can CLINCH first round bye with a WIN against the Bears at HOME on Sunday OR if the Panthers LOSE to the Falcons. The Rams CLINCHED the NFC West with a WIN over the Titans on Sunday. The Rams CANNOT move UP in the NFC, they can only move DOWN based on how things play out in the NFC on Sunday. The Saints CONTINUE to WIN but have NOT been able to CLINCH their division just yet. They OWN the Tiebreaker over the Panthers and have a chance to move UP in the NFC seeds on Sunday. Clinching Scenarios- The Saints CLINCH the NFC South with a WIN over the Bucs on the ROAD OR if the Panthers LOSE to the Falcons on the ROAD on Sunday. The Panthers got a LAST MINUTE over the Bucs on Sunday and CLINCHED a playoff berth in the process. The Panthers can end up ANYWHERE from the TWO to the FIVE seeds in the NFC based on how MURKY things get on Sunday. Clinching Scenarios- The Panthers can CLINCH the NFC South with a WIN over the Falcons AND a Saints LOSS to the Bucs. The Panthers get a first round bye with a WIN AND LOSSES by the Saints, the Rams, and the Vikings. The Falcons had a CHANCE to WIN the NFC South, but with a LOSS to the Saints on Sunday, but they still control their OWN destiny for the playoffs. Clinching Scenario- The Falcons can CLINCH a playoff berth with a WIN over the Panthers OR if the Seahawks LOSE to the Cardinals at HOME on Sunday. The Seahawks beat the Cowboys and are now the ONLY team ALIVE in the NFC, that would NOT make the playoffs if the season ended TODAY. The Seahawks need some HELP to get into the playoffs, but they will probably get IN. Clinching Scenario- The Seattle CLINCH a playoff berth with a WIN over the Cardinals AND if the Falcons LOSE to the Panthers. Check back NEXT WEEK to see which teams made the playoffs and their OUTLOOK for the playoffs to get to the Super Bowl.